When you buy a new computer, you start with a clean slate, which is great, but you don't have any of your documents or settings from your old computer. 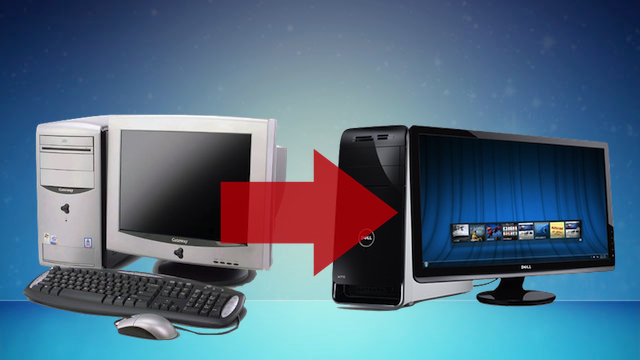 Luckily, it's very easy to transfer all your files and settings from your old computer to the new one - whether you're on Windows or a Mac.If you're migrating from Windows to Windows or a Mac to a new Mac, you can use your operating system's built-in tools to migrate your data. If you're moving between platforms, you can still do it, you just won't be using any tools. In general, however, no matter what kind of computer you use, you'll probably need an external drive to pull this off, so if you don't have one, go pick one up. Once you're done migrating your data, it works great for backing it up in case anything happens. Windows 7 has a great tool built-in called Windows Easy Transfer, that can grab your data from an old computer - even one running Windows XP - and transfer it to your new machine with an external drive. To set it up, plug in your external drive and hit the Start menu on your new machine. In the search box, type "Windows Easy Transfer" and click on the shortcut when it pops up. If you're running Windows XP, you'll need to install the Windows Easy Transfer files to your external hard drive first. Hit Next at the first window, then hit "An External Hard Disk or USB Flash Drive". Then click "This Is My New Computer" and hit "No" at the next screen. Click "I Need to Install It Now" and pick your external hard disk when prompted. Windows will copy the necessary files, which should only take a minute. When it's done, unplug it and plug it into your old computer. If you don't get an autorun prompt, head to My Computer and double-click on your external hard drive. From there, it'll ask you if you want to install Windows Easy Transfer on your Windows XP machine. After it does, it will scan your computer for data to transfer. Select the users you want to copy over and hit Next. Save the data to your external drive or flash drive and wait for it to transfer (this might take awhile). If your old computer is running Windows 7, you can skip all the above steps and just open Easy Transfer directly from the Start Menu's search box and picking "This Is My Old Computer". It will then perform the above steps and transfer your data to the external drive. Once you've moved your user data from your old computer to the external drive, head back to your new computer and plug the external drive back in to your new computer. If you closed the Easy Transfer Window, open it back up and navigate through the steps again, this time picking "Yes" when it asks you if Windows Easy Transfer has already saved your files to an external drive. Select your drive from the list and check the users you want to transfer over. Wait as it transfers all your data (again, this could take a few minutes). When it's done, your computer will restart, and you should see that all your files and settings are available on your new machine. Note that this won't migrate any of your programs, just your settings and documents. It will, however, let you know what programs you had on your old computer so you can write down a quick list of the programs you'll want to reinstall. For this, you'll either need to hook up your two Macs with a FireWire cable, or transfer data from a Time Machine backup drive (if you have one). So start up your new Mac and plug in your old Mac or Time Machine drive, and open up Migration Assistant from /Applications/Utilities. Hit continue at the first window, then pick "from another Mac" or "from a Time Machine backup", depending on where you're grabbing your old data. It'll present you with a checklist of items, from which you can select what you want to migrate. In general, you'll want to select everything here - that'll make sure all your documents, settings, applications, even your wallpaper transfer to the new computer, and it'll be like you just started up your old Mac with shiny new hardware. The only situation in which this won't work is if your new hard drive is actually smaller than your old one, which might happen if your new computer has an SSD. In this case, unselect the less important things until it says you have enough room. You can always transfer other stuff later using the external drive method below. If you're migrating to a new computer of a different type (that is, if you're moving from Mac to Windows or Windows to Mac), there isn't a simple migration utility that will move everything for you. In this case, you'll have to do it manually with an external hard drive. This is actually quite simple to do, and since you don't have any settings to move, you don't really need an extra utility - it's just a matter of drag-and-drop. The first thing you'll have to do is format your drive to work with your old computer. If your old computer is a Windows machine, plug it in and right-click on its entry in Windows Explorer. Hit the "Format" button, and choose NTFS as the file system. A Quick Format is fine; we just need to make it compatible with this computer. Note that this will erase anything currently on the drive; so make sure it doesn't have anything on it you want to keep. On a Mac, open up Disk Utility from /Applications/Utilities and find your external drive in the list on the left. Click on it, and then hit the "Erase" tab on the right. Format it as "Mac OS X Extended (Journaled)" and hit Erase. Again, this will erase everything on the drive. Next, open up the newly formatted drive in your file explorer (Windows Explorer on Windows, Finder on the Mac). Open up another window in your file explorer and head to your user folder. On Windows, your user folder is located at C:\Users\Username, and on a Mac you can access it by clicking on your username in the Finder sidebar. In both cases, you should see all your user folders - like Documents, Music, Movies, Photos and Desktop. Drag all of the folders in which you've saved files - like your Documents, Photos and Music folders - to your external drive. You don't need to drag every folder in there, just the ones you use - folders like AppData on Windows or Library on OS X don't need to be copied. Once it finishes, unplug the drive and plug it into your new computer. From there, you can open up each folder individually and drag those files wherever you want. For example, you can open up the Documents folder on your external drive, and drag all those files to the Documents folder on your new computer. Once you're done, you should have quick access to all your old files, whether they be documents, music or photos, and you won't need to use your old computer anymore. Depending on your setup, you may want to run a 'chown -R newuser /home/newuser' on the new machine afterwards. I'm going to try it with my ZIP drive. Looks easy.